YAY! 4.4 pounds is a big, big loss. I was also on the tail-end of completing the Mamavation Two-Week Bootcamp, so being forced to do burpees and arm curls and cardio helped, too. I’m so relieved that the first week of “Simple Start” worked. Basically, it’s a plan focused on lean proteins and dairys, whole grains, vegetables and limited fats. It’s pretty much a “Don’t Eat Crap” manifesto, though you can choose one crap item (junk food) per night, with suggestions being things like a Weight Watchers ice cream, a glass of wine, etc. 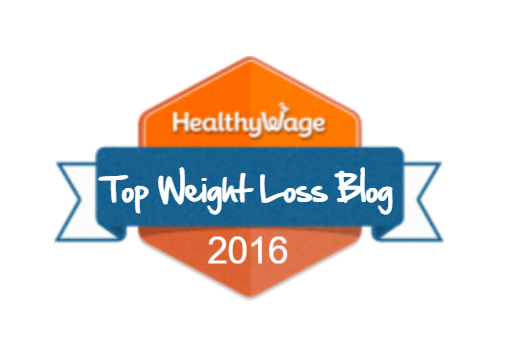 My crap items were Weight Watchers Dulce de Leche ice cream bars (they’re okay. Kinda fake. Not my fav), oatmeal chocolate chip cookies I made, and one night, two squares of white Irish cheddar cheese. Deeeeeelish. This week, I need to be aggressive about staying “good” — sometimes when I have a strong success like this, I tend to think “Oh! I did so good last week that I can cheat a little bit and I’ll still lose weight!” Nope, not so much. Don’t wanna get over confident over here. However, I did realize this week this is the first time I’m trying a “real” weight-loss plan again now that I know what’s up my wacky body, and that’s exciting. I was also thrilled this week to hear from three different people that it looked like I was losing weight. Those comments are so encouraging to me, because I see myself all day, every day. Hearing it from someone else is sometimes exactly what you need to remember why you’re choosing the salad over the pizza. So that’s my awesome news for the week! Can’t wait to share with you next week about my next weigh in, and I can only hope it will be as good as this one, but I’ll be happy with any sort of loss. 🙂 I’ll be back soon to tell you about my newest fitness gadget, the Fitbit Force! I’ve learned something about myself the past few years. I can’t just decide one day to lose weight and just do it. I have to decide almost every minute of every day. At least once an hour. I need to decide to drink water, to get moving, to not eat bread, or cookies, or candy. To refuse the movie popcorn. I need to recommit. I’m fiercely loyal to the things I love. Clearly, weight loss is not a thing I love. So I saw Gravity. And for a riveting two hours, I sat, consumed with emotion and angst, completely lost in the story. The movie was phenomenal, and my husband and I left shaky and tense, rocked by the amazing visual effects and captivating storyline. We’re still talking about the movie today. I didn’t even miss the popcorn. Sure, the smell always seduces me when I walk in, but I didn’t need the crunch, the salt, the butter, the motions, the kernels in my teeth. I didn’t need popcorn. I didn’t need snacks. I didn’t need to start tomorrow. I needed to start today. While I am certainly not a morning person, getting a great work out before the day begins is awesome. It was done for the day and I went to work feeling nice and awake and stretched out and limber. I have lazy tendencies, and need to push myself to work harder when it comes to fitness. My bootcamp instructor was great about encouraging me to do more, and it worked. Sometimes a gentle nudge is all I need. Five weeks seems short, but it made A LOT of difference in my fitness regimen. How much? Let’s see! 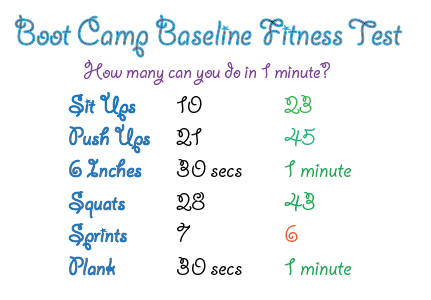 On the first day of the class, we did baseline fitness testing where for one full minute, we counted the number of crunches, squats, sprints and “six inches” that we could do. Six Inches means you hold your feet and legs off the floor, six inches above the ground, using your core to support you. I was most proud of my improvements on plank. For some reason, the plank is always the fitness move that eludes me, where I try and try to hoist my body up, teetering on my elbows like a hot dog held up by toothpicks. I’ve finally mastered it, and at the beginning of the five weeks, I thought I was going to die after 15 seconds – and now I can actually hold it up to a minute and 30 seconds. AWESOME! As you can see above, I improved in every category except for sprints. I am tryiiiiing so hard to like running, but I think I finally hit the nail on the head for why it’s not uber enjoyable for me. It’s HARD to move this body, with an extra 70 pounds. I am agile, flexible and strong, but I am not FAST – and that’s so much of what running seems to be. However, I recognize that it’s an amazing cardio element, so I’m going to try to keep it up. All in all, after five weeks of bootcamp, I lost 9 inches over all and greatly improved my fitness. I’m already debating signing up again because it felt so much more rewarding for me than my gym. As much as I love Zumba and boxing, this fitness regimen really got me movin’ and combined cardio and strength, and I loved being outside in the morning, watching the squirrels find their breakfast, seeing the sun rising up over the smoggy skies of Los Angeles. As far as weight, I haven’t gotten on the scale since last week’s kerfuffle, but I’ll be back on it soon. When I’m done with school, I have an appointment with my doctor, just to double check that hormonally, everything is right. Sometimes you just have a feeling something’s wrong, and I want to just double check. In reflecting back, losing weight has been about 94% impossible for me the past year, so I just need to confirm that it’s all good in the hood and it’s likely behavior (food) and not physiology (hormones) that’s making this so challenging. Anyhoo! So that was bootcamp! I surprisingly loved it. I hope you have a fantastic Monday – I’ll be back tomorrow!